One of the most striking features of the Viking Age was the vast trade network that the Norse maintained, which stretched from Greenland in the west to Baghdad and central Asia in the east, and encompassed virtually all of the peoples who lived in between. During the Viking Age, as in all ages that preceded it, the Scandinavian economy was primarily a subsistence economy. Just about everyone lived on rural farmsteads. Each household produced most of what its members needed to sustain themselves, and the average person possessed few luxury items. Even before the Viking Age, however, a limited degree of domestic trade existed as well, primarily in the form of seasonal rural markets. Around the beginning of the Viking Age in the eighth century, however, Scandinavia’s first urban centers started to appear around the Baltic Sea and the North Sea. Although only about 1-2% of the population lived in these “trade towns,” as they’re often called today, their effect on the Scandinavian economy was far bigger than that figure might suggest. That’s because the trade towns, as the term implies, brought Scandinavia into the wider Eurasian trade networks that existed during this period. Most Scandinavian farmsteads produced the craft goods their members needed – clothes, tools, etc. – on their own. But with the rise of the trade towns, many more people were able to become specialists in one or another of these crafts. Blacksmiths, jewelers, bead-makers, antler-workers, and other such full-time craftspeople flocked to the trade towns to produce their goods for export to foreign markets rather than just for subsistence or the limited trade that occurred domestically. Archaeologists have found much evidence for long-distance trade of a remarkable variety of goods: small ceramic bottles with mercury, amber, bars of iron, lead, silver, brass, foreign jewelry including carnelian and rock crystal, glass, foreign pottery, silk, a set of counterfeit Arab dirhams, and wine barrels from the Rhineland, which were reused to line well shafts. Among northern products found in Hedeby are walrus bones, reindeer antlers, Norwegian soapstone, and whetstones. We know from other evidence that fur and most textiles were also traded at Hedeby, but they did not leave much trace in the archaeological material, since most organic matter perishes over a millennium. An iron lock from a set of slave fetters, found in the town’s harbor, reminds us of Hedeby’s slave trade. Furs from Scandinavia were particularly prized abroad, since the cold climate lent itself to the local mammals having thick, luxuriant pelts. Furs were one of the two largest pillars of Viking trade. The other was slaves. All of Eurasia participated in the slave trade during this period, and the Vikings were no exception. The primary buyer of slaves sold by the Vikings was the Arab Caliphate, with the transactions occurring largely in Eastern Europe and in Mediterranean ports such as Venice and Marseilles. The slaves the Vikings sold were typically men and women they captured in raids. Since the Vikings raided each others’ settlements, this means that they not infrequently sold each other into slavery. They seem to have made little to no distinction in this regard between Scandinavians and non-Scandinavians, pagans and Christians, etc. – market value was all they cared about. Trade towns themselves were subject to Viking raids, and we can imagine that with all of the valuable goods being produced and exchanged there, the trade towns would have made particularly attractive targets. The Vikings’ goals in engaging in the international trade of the period primarily had to do with their rulers’ appetite for foreign luxury goods. Such imported items were impressive status symbols, and it should therefore come as no surprise that the founders and governors of Viking trade towns were often Viking chieftains themselves. Since the richest chieftains could afford to be the most generous toward the warriors who fought for them, the size of a chieftain’s fighting force was often proportional to his wealth. The bigger his army was, in turn, the more successful a chieftain stood to be when it came to raiding – thereby further enhancing his wealth and the number of men fighting under his command. 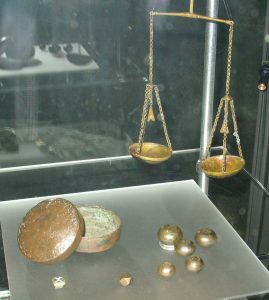 However, simple Viking farmers sometimes owned weights for silver, which implies that they had at least a little silver to purchase things from the outside world for their farm. This shows that even if trade primarily served to provide chieftains with luxury goods, that was far from its sole purpose. The inhabitants of the rural areas surrounding trade towns often traded whatever they might have had a surplus of – typically food – for other goods that passed through the trade towns. Bulk trade of commodities had been present to some degree all along, but by the year 1000, it became a much more prominent element, and was even to a large extent replacing the earlier, luxury-driven form of trade. Many of the big trade towns of the luxury era vanished, and visitors to their former sites reported only ruins and wilderness. What had happened to bring about this enormous change? The answer lies in the transition the Scandinavians were undergoing from one political model to another. The earlier model of chieftains ruling over a small group of people was being replaced with one characterized by kings who ruled over a large area of land. By enabling a few chieftains to become so wealthy that they had the power to become kings, the trade towns ironically facilitated their own demise. The trade towns gave way to larger urban areas, which became the administrative centers for the new kings. Want to learn more about Viking trade and commerce, and the Vikings in general? My list of The 10 Best Books on the Vikings will surely prove helpful to you. Winroth, Anders. 2014. The Age of the Vikings. p. 103-104. Skre, Dagfinn. 2012. The Development of Urbanism in Scandinavia. In The Viking World. Edited by Stefan Brink and Neil Price. p. 87. Graham-Campbell, James. 2013. The Viking World. Winroth, Anders. 2014. The Age of the Vikings. p. 107-108. Skre, Dagfinn. 2012. The Development of Urbanism in Scandinavia. In The Viking World. Edited by Stefan Brink and Neil Price. p. 83-84. Winroth, Anders. 2014. The Age of the Vikings. p. 127-128.